While epilepsy is commonly accompanied by dizziness or vertigo, vertigo is only rarely caused by epilepsy (Bladin 1998). This arises primarily because vertigo is much more commonly caused by ear conditions. A related phenomenon is "reflex epilepsy" (Xue et al, 2006). These are epileptic seizures precpiated by general sensory stimuli - -such as light, thinking, decision making. The "focal" reflex epilepsies may be provoked by reading, writing, startle, somatosensory stimulation, proprioception, auditory stimuli, immersion in hot water, eating, and vestibular stimulation. Thus, certain sounds or types of movement can provoke cortical seizures. Another electrical disorder, which can overlap with these possibilities, is vestibular neuralgia. Although a misnomer (algia means pain and there is no pain here), this is a condition in which the vestibular nerve becomes irritable and spontaneously produces an abnormal sensation of movement. There is very little known about vestibular neuralgia. In some instances, it may be caused by microvascular compression syndrome. It is sometimes called "vestibular paroxysmia", which is a more vague but somewhat more appropriate term. Rarely, epilepsy is accompanied by tinnitus. Stimulation of human auditory cortex can suppress hearing or enhance tinnitus (Fenoy et al, 2006). In persons who have bilateral synchronous hearing symptoms, clinicians usually consider electrical or vascular cortical phenomena such as migraine aura as the cause. Epileptic vertigo is generally only a diagnostic problem when the person does not have a full seizure -- in other words, they do not have the convulsions, psychomotor symptoms or twitching characteristic of classic partial or generalized seizures. According to Tarnutzer et al (2015) vertigo without a seizure -- isolated "EVD" is about 10 times less common than non-isolated EVD. In most instances, it presents as a "quick spin" type symptom. The person notes that the world makes a quick horizontal movement, lasting roughly 1-2 seconds at most. Quick spins must be differentiated from a variety of other conditions including vestibular neuralgia due to microvascular compression, Meniere's syndrome, and BPPV among others. Occasional people also develop this symptom who have ectatic basilar arteries. Rapidly generalized seizures are generally incompatible with epileptic vertigo as persons with generalized seizures will not remember their aura. Reflex vestibular epilepsy can be difficult to diagnose as most EEG labs are unable to provide vestibular stimulation during their recordings. This can be accomplished in a lab equipped for both caloric and EEG testing. Diagnostic tests that are particularly helpful include the EEG and MRI scan of the head. In essence when these tests are normal, a response to an anticonvulsant medication is suggestive of vestibular neuralgia. When the EEG is definitely abnormal, vestibular epilepsy is diagnosed. One must be cautious here as many otherwise normal persons have mildly abnormal EEG tests. When there is no response to medication, then the probability of one of the other disorders mentioned above is increased. Epileptic and neuralgic vertigo generally responds well to traditional anticonvulsants such as oxcarbamazine and related medications. Oxcarbamazine also treats vestibular paroxysmia. According to Xue, generalized reflex seizures usually respond to valproate treatment (Xue, 2006). Valproate also treats migraine. In the case illustrated below, a child became dizzy, developed nystagmus, and briefly became unresponsive. EEG of child with a vestibular seizure. On the bottom right the electrical activity of the brain changes markedly (Tusa et al, 1990). A man in his mid 40's reported episodic unsteadness, when exposed to "strobing" lights, such as those on a police car. The trigger was reliable and consistent. Neurological and otological examination was normal. Testing of inner ear function was entirely normal. 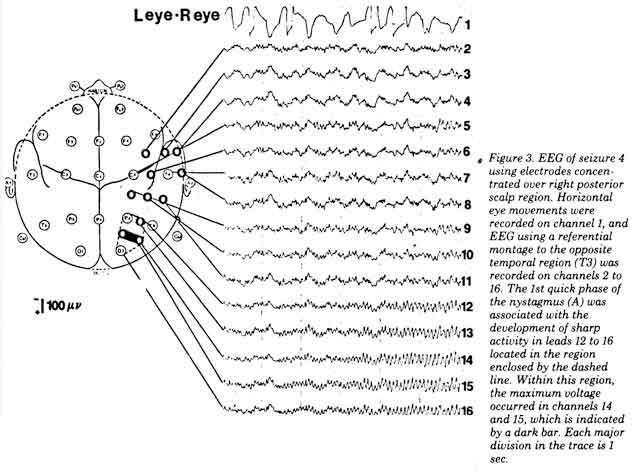 An EEG revealed occasional spikes in the left temporal lobe. MRI of the brain was normal. Comment:: Unsteadiness triggered by flashing lights, combined with normal inner ear studies is suggestive of epileptic vertigo. Treatment with an anticonvulsant was proposed. This case is courtesy of Dr. Marcello Cherchi. Bladin, P. F. (1998). "History of "epileptic vertigo": its medical, social, and forensic problems." Epilepsia 39(4): 442-7. Blanke, O., S. Perrig, et al. (2000). "Simple and complex vestibular responses induced by electrical cortical stimulation of the parietal cortex in humans." J Neurol Neurosurg Psychiatry 69(4): 553-6. Fenoy, A. J., M. A. Severson, et al. (2006). "Hearing suppression induced by electrical stimulation of human auditory cortex." Brain Res 1118(1): 75-83. Kahane, P., D. Hoffmann, et al. (2003). "Reappraisal of the human vestibular cortex by cortical electrical stimulation study." Ann Neurol 54(5): 615-24. Laff R, Mesad S and Devinsky O (2003). "Epileptic kinetopsia: Ictal illusory motion perception." Neurology 61(9): 1262-4. Tusa RJ, Kaplan PW, Hain TC, Naidu S: Ipsiversive eye deviation and epileptic nystagmus. Neurology. 1990. Wiest, G., F. Zimprich, et al. (2004). "Vestibular processing in human paramedian precuneus as shown by electrical cortical stimulation." Neurology 62(3): 473-5. Xue, L. Y. and A. L. Ritaccio (2006). "Reflex seizures and reflex epilepsy." Am J Electroneurodiagnostic Technol 46(1): 39-48.